In addition to daily performances and activities on the National Mall, the Smithsonian Folklife Festival organizes and recommends events and exhibitions at other Smithsonian museums and venues around Washington, D.C. All events are free unless otherwise noted. Through almost 200 museum artifacts and about 100 loan objects, this ongoing exhibition shows how the many voices of the American people have contributed to and continue to shape the nation and its communities, from its earliest beginnings to the present. July 8, 2018, 6 to 7 p.m.
2700 F St. NW, Washington, D.C.
Avant garde folk artist and GRAMMY-winning multi-instrumentalist Arto Tunçboyaciyan has performed with everyone from Chet Baker to Joe Zawinul to Eleftheria Arvanitaki. He makes a rare appearance in D.C. for an evening of music drawing from the sonic soul of Armenia and beyond. July 7, 2018, 6 to 7 p.m. The Smithsonian Folklife Festival joins Roadwork in celebrating its fortieth anniversary as a D.C.-based multiracial coalition that puts women artists on the road globally. This special concert showcase features D.C. artists Ysaye Maria Barnwell, Be Steadwell, and Carolyn Malachi. The Sisterfire celebrations continue at the Folklife Festival on July 8. July 6, 2018, 6 to 7 p.m. Winners of the 2016 Premi Ciutat de Barcelona (City of Barcelona Award), vocalist Maria Arnal and guitarist Marcel Bagés beautifully blend old and new. Performing to sold-out venues throughout Catalonia and beyond, they draw from field recordings, record libraries, and their personal archives to create new and unique compositions. With each concert, they reinvigorate the very notion of what folk music can be. July 5, 2018, 6:30 p.m.
Director Joe Berlinger examines the Armenian Genocide through seated interviews with experts and behind-the-scenes footage of Terry George’s historical drama The Promise. Supported by the ANCA Endowment Fund #KeepThePromise. July 5, 2018, 6 to 7 p.m. Founded by musician and educator Tsovinar Hovhannisyan, the Nur Qanon Ensemble was created to encourage Armenian girls and young women to take up an instrument traditionally played by men. The Ensemble has gone on to produce virtuosic musicians, sparking a “gender revolution” in their wake and bringing fresh energy to concert stages around the world. July 3, 2018, 6 to 7 p.m. Co-founder of the band Night Ark, Ara Dinkjian is considered one of the top oud players in the world. His earliest professional experience was as an accompanist for his father, renowned Armenian folk and liturgical singer Onnik Dinkjian. These master musicians will be joined by the New York Gypsy All Stars featuring Engin Gunaydin (drums), Ismail Lumanovski (clarinet), Tamer Pinarbasi (kanun), and Pablo Vergara (keyboard). 10 First St. SE, Washington, D.C.
July 2, 2018, 6 to 7 p.m.
Cobla Catalana del Sons Essencials is the latest project of Catalan musician, composer, and educator Marcel Casellas. In Catalonia, a cobla is an eleven-piece ensemble of both classical and traditional horns with a string bass that is known for accompanying the emblematic Sardana dance. CCSE offers a new twist to this ensemble form, adding hints of jazz and percussion instruments from around the world. June 29, 2018, 6:30 p.m.
701 Pennsylvania Ave. NW, Washington, D.C. This film tells the story of Mikael, a young Armenian who dreams of studying medicine. When he travels to Constantinople to study, he meets and falls in love with fellow Armenian Ana, although she is dating Chris, an American photographer sent to Turkey to document the first genocide of the twentieth century. A love triangle settles amid the horrors of war. Supported by the ANCA Endowment Fund #KeepThePromise. June 29, 2018, noon to 1 p.m. Mystic minstrels from the Indian state of West Bengal, bauls are known for devotional songs that honor the divine within. Their sung poetry has inspired everyone from Rabindranath Tagore to Bob Dylan. This performance features Girish Khyapa, Rabi Das Baul, Arpan Thakur Chakraborty, and Manas Acharya. In addition, Mamoni Chitrakar will perform pater gaan (songs accompanying traditional scroll paintings). Presented in partnership with the American Folklife Center with the support of Contact Base–West Bengal and Communities Connecting Heritage (U.S. State Department and World Learning). June 26, 2018, 6:30–9 p.m.
701 Ninth St. NW, Washington, D.C.
Zaytinya and head chef Michael Costa are thrilled to welcome James Beard Award-winning chef Carrie Nahabedian, head chef and owner of Chicago’s seven-time Michelin Star restaurant NAHA. Chefs Costa and Nahabedian have collaborated to create an exclusive menu, highlighting ingredients and dishes from Armenia. Each course will be expertly paired with wines, some of them hailing from Armenia. Reservations with $95 ticket are required. June 26, 2018, noon to 1 p.m. Founded by musician and educator Tsovinar Hovhannisyan, the Nur Qanon Ensemble was created to encourage Armenian girls and young women to take up an instrument traditionally played by men. The ensemble has gone on to produce virtuosic musicians, sparking a “gender revolution” in their wake and bringing fresh energy to concert stages around the world. Presented in partnership with the American Folklife Center. June 26, 2018, 8:30 a.m. to 5 p.m. 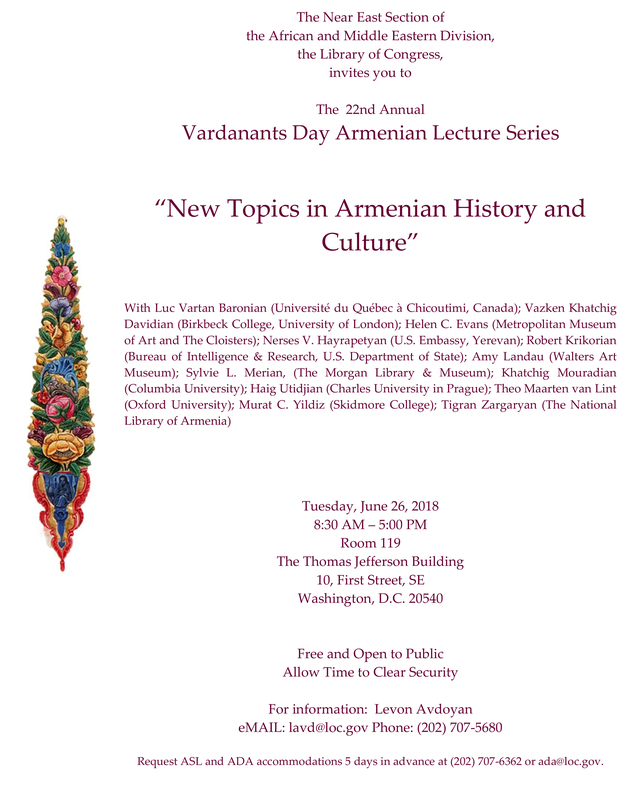 The Vardanants Day Armenian Lecture, sponsored by the Near East Section of the African and Middle Eastern Division, will feature twelve speakers from universities, museums, and embassies in Armenia, the United States, and beyond. See online flyer for more information. June 23, 2018, 2 p.m.
2401 Foxhall Road NW, Washington D.C.
Born Vostanik Manoug Adoian in the village of Khokorm near Lake Van in the Ottoman Empire, Armenian American Arshile Gorky (c. 1902–1948) was one of the most influential painters of the twentieth century. The land of his birth—as well as the loss and suffering experienced in it—found its way into an extraordinary body of work. One such painting, Image in Khokorm, is now view in at the Kreeger Museum. Join us for a spirited talk on the piece and what it says about place, longing, and creativity, led by museum docent Irene Abrahamian. The afternoon will include music and light refreshments. June 22, 2018, 7:30 p.m.
101 Independence Ave. SE, Washington, D.C. This documentary film tells the story of Armenian tightrope walkers Zhora and Knyaz, both in their seventies. Having been bitter rivals throughout their lives, they come together to train sixteen-year-old Hovsep, the only tightrope dancing student in the country. Light refreshment will be served before the screening, and a short panel discussion will follow. Presented in partnership with the American Folklife Center. June 3, 2018, 4 to 4:45 p.m.
As part of the annual Washington Folk Festival, Carolyn Rapkievian will teach a workshop with the Arev Armenian Dance Ensemble and the Hyetones Folk Band. Presented by the Folklore Society of Greater Washington and the Glen Echo Park Partnership, the festival is free to the public and held rain or shine. May 14, 2018, 5 to 11 p.m.
1346 Florida Ave. NW, Washington, D.C.
Syrian Armenian chef Andranig Kilislian will join the team at Maydān for a special one-evening event, preparing dishes—including lahmajun (“Armenian pizza”)—from Abu Hagop, his restaurant in Yerevan, Armenia. 301 A St. SE, Washington, D.C. Classical Movements will present these celebrated early music masters in The « Llibre Vermell » of Montserrat: Songs and Dances in Honor of the Black Virgin of the Montserrat Abbey (14th Century). The concert is co-presented with the Folklife Festival and Institut Ramon Llull, in anticipation of the 2018 Festival program Catalonia: Tradition and Creativity from the Mediterranean. April 22, 2018, 11 a.m.–4 p.m. The International Day of the Book is a celebration of literature that draws its inspiration from a Catalan tradition, the Festival of the Rose. On this day in Barcelona, bookstalls and street festivities run the length of the picturesque La Rambla, the old city’s main boulevard. In Kensington, local authors, poets, publishers, children’s authors, literary and community organizations set up along three blocks of Howard and Armory Avenues for a day of live music, cookbook demos, poetry readings, food, crafts, and special guests. The Eyes of the Journey is a poetic film that expresses the feelings of Andean culture toward Mother Earth, and the search for a deeper understanding of nature as a living being, as an eternal companion for humankind. This free screening is presented in partnership with the D.C. Environmental Film Festival. March 17, 2018, 12:30 p.m.
See four short films exploring indigenous language and environment issues: Identidad/Identity (Panama, 2017), We Prayed in Water (USA, 2012), Shash Jaa’: Bears Ears (USA, 2016), and Then, Now, and Forever: Zuni in the Grand Canyon (USA, 2017). This free screening is presented in partnership with the D.C. Environmental Film Festival. This free four-day festival hosted by the Smithsonian’s Recovering Voices (including the Center for Folklife and Cultural Heritage) will open on United Nations Mother Language Day, celebrating language and cultural diversity through feature films, shorts, music videos, and more. February 11, 2018, 5–7 p.m.
235 Carroll St. NW, Washington, D.C.
Roadwork was founded in 1978 as a multiracial coalition that put women’s culture on the road—from the Sisterfire Festival to Sweet Honey In The Rock, from Holly Near to Toshi Reagon, and so many more. In 2018, we are partnering with Roadwork to celebrate the organization and its dedication to creating a trail for new generations of resister-activists. The venue is wheelchair accessible, and American Sign Language interpretation is provided.